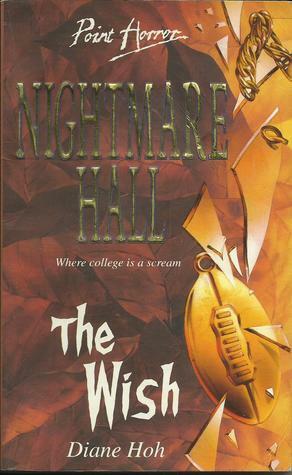 Today I'm going to be introducing you to my current read The Wish and why it may be one of the most far-fetched and weirdest Point Horrors. Expect a lot of Point Horror reviews and currently reading posts this month because it is after all Halloween - which is almost better than Christmas in my opinion even though it's not really celebrated in the UK. Alex is the first to notice the strange little booth in the campus pizza place. Wishes granted, fortunes told says the sign. Inside sits The Wizard, an eerie wooden figure with sinister blue eyes. Alex's friends all make wishes. And, one by one, their wishes come true - but in terrifying, twisted ways. Could The Wizard be behind the horror? Or is it someone else - someone with a deadly wish all of their own? Freakishly weird plotline that I guess if probably more sci-fi than horror. I don't really like this cover - with the exception of the autumn leaves in the background , brown and DEAD - it would be so much better if it was a picture of the menacing Wizard. I'm on page 66 and it's already been ridiculous - an immensely strong gust of wind attempts to blow the protagonist off of a balcony 8 floors up . Seriously Diane ? But there'll be more on these crazy features in my recap/review which will probably be posted tomorrow. Basically a Teaser Tidbit challenge is a showcase of a taster from my current read to entice you to add it to your TBR pile.